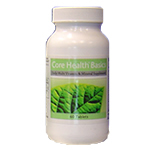 No matter what other supplements you take to address specific needs, you will always want to keep Core Health Basics at the centre of your nutritional program. A comprehensive formula of 19 vitamins and minerals specifically designed to maintain complete well-being and keep you in a tip top condition always. Vitamin A – supports the skeletal and skin systems. It also helps assist vision.